Lucky for us vintage gals, belts have remained a pretty classic part of wardrobes throughout the decades, and many modern belts are perfect for accessorizing vintage looks. However, it can be hard to find a belt that fits your waist correctly if it isn't made of stretchy material, since most belts don't come in sizes as specific as back in the day. 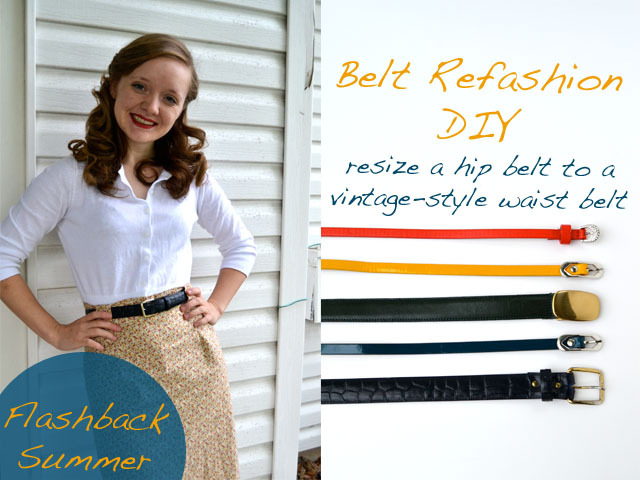 Not to mention that though skinny waist belts are in right now, they can be above 15 bucks a pop! Here is a quick, cheap, and easy way to add holes to lengthen a smaller belt, make a belt a bit tighter, or turn a hip belt into a waist belt. (Hint: This DIY doesn't use "proper" tools, just things you may have around your house. Thus, while the belt will definitely look good and be functional, it may not look exactly like a machine-made belt. 1. First, put your belt on and determine how big a size change you need to make. If it's just a hair too big or too small, you can simply add a hole or two in either direction to solve your problem (with those instructions coming in a moment). However, if it's much too big (such as in turning a hip belt into a waist belt), then be sure to read the tutorial all the way to the end for more extreme resizing. 2. Mark where the holes should go. small resize- Just look at the spacing of the holes that are already there, and add a couple more in the direction (bigger or smaller) that you think would be needed. The belt makers already figured out good increments to increase the size, so just continue that pattern as far as necessary. extreme resize- put your belt on, and mark where it feels comfortably snug. Then, give yourself a few options on either side. (We all have those days where our waist is slightly bigger or smaller than the day before!) For an easy way to figure out how far apart to place the holes, line up your belt hole with another belt's hole and mark the next spots on either side. Or, I've also found that about 1/2"-3/4" apart works well, too. 3. Set the belt on a flat, hardy surface, and use the thin knife to poke a small hole from the underside to the front of your belt on the marks you just made. Then to make sure the hole goes all the way through, poke from the front to the back. (Don't twist the knife, just poke a little. Your knife probably widens from the tip to the base, so twisting will just dig into the belt on the edges of the hole and scrape the color off.) Be careful not to cut yourself, and I recommend leaving the belt on the table so you don't inadvertently push too hard on the knife and make a large slit. 4. Use your awl-like item and poke from the front to the back. Twist. (Poking from the front to the back will make the hole look better and more polished.) Then, twist until the hole is large enough to accommodate the buckle prong. You can look at the belt's other holes for comparison. 5. If at the end of making the holes where you want them to be you still have a long "belt tail" of leftover length, you may want to snip off the end to shorten it. I like to replicate the belt's original end shape (rounded, squared off, pointed, etc.). Just cut it as you like. If the belt is a different color than the inside original materials and it's bothering you, simply color the edge with a marker or tiny bit of permanent paint to match the other edges of the belt. Voila! No more cinching too tightly, no more frustrating excess length! Your new, perfectly fitting belt is ready to go! * The thinner the belt, the easier it will be to poke through. * The difficulty of poking will be largely determined by the type of material the belt is made of. Thick plastic will be harder to poke through than a thin leather. * If the material is really thin, you can also simply use a small hole punch to make the holes, but this will only work with really thin materials (or a very strong hole punch). I just used this today to alter a belt, it works really well! I found it a bit easier to poke the original holes with the knife from back to front before poking the final hole with my screwdriver from front to back, but otherwise I followed the tutorial exactly.